Dubai, UAE, October 22, 2018: Jeremy Clarkson has announced the Lamborghini Huracán Performante as his 2018 Car of the Year. Jeremy Clarkson presented the award to Lamborghini's Board Director for Research and Development, Maurizio Reggiani, at an awards ceremony in News Corp's London headquarters, where The Sunday Times and The Sun newspapers also presented their inaugural motoring awards. 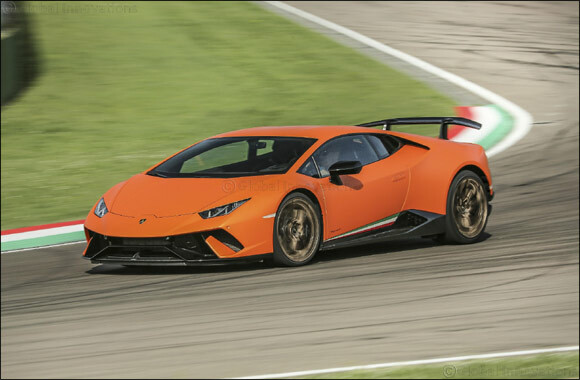 Featuring Lamborghini's patented active aerodynamics system and aero vectoring, the Lamborghini Huracán Performante and the open-top Spyder version represent a convergence of technologies to produce not only the best circuit times but the most dynamic and enjoyable road driving.The coup�'s V10 naturally-aspirated engine accelerates from 0-100km/h in just 2.9 seconds and has a top speed of 325 km/h.